Paulo Sousa is the Managing Director in charge of the EBRD’s Financial Strategy and Business Planning group. He is responsible for the Bank’s financial strategic planning and budget, including the capital planning and adequacy function and financial policies. 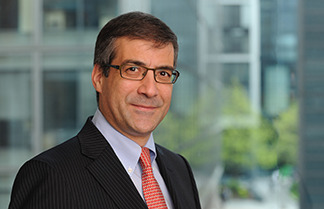 Mr Sousa joined the EBRD in 2011 after 24 years in senior leadership positions in international banking. His career spans a broad range of responsibilities from wholesale client coverage, to structured finance/debt, transactional banking, securities servicing, risk and capital management, strategy and banking regulatory matters. Mr Sousa started his working life in 1987 at Manufacturers Hanover in Portugal and later joined ABN AMRO Bank for whom he worked from 1991 until 2009 in progressively senior roles, including: Head of Loan Syndications and Structured Finance for Latin America; MD Head of Public Sector; Deputy CEO of the ABN AMRO Mellon joint venture; Group Chief Operating Officer of Risk Management; and as the executive in charge of the integration of risk management of ABN AMRO into the Royal Bank of Scotland. In 2010, Mr Sousea acted as adviser to the European Parliament on the reform of the banking system, Basel III, and the new European architecture of supervision and bank resolution regimes. In 2011, he was invited to join a steering committee with the Central Bank of Portugal, the IMF, the European Commission and the European Central Bank that oversaw an assessment of the solvency levels of Portuguese banks. Paulo Sousa, a Portuguese citizen, has lived and worked in Spain, the Netherlands, the UK and the USA. He graduated in Economics from the Oporto University, Portugal in 1986.